The National Film Board of Canada (NFB) and Améri Ka Productions present the world premiere of Ginette Pellerin’s eagerly awaited documentary Antonine Maillet – Les possibles sont infinis (Antonine Maillet – The Possibilities Are Endless), at 8:00 pm, Wednesday, November 18, at the Capitol Theatre in Moncton. This public event, held in cooperation with the Université de Moncton, marks the 30th anniversary of Maillet winning the Prix Goncourt for her novel Pélagie-la-Charrette. The acclaimed Acadian writer, the only Canadian winner of the prestigious award, will be present at the launch, along with the film’s director and special guests, including Monique Simard, Director General of the NFB French Program, and Yvon Fontaine, Rector of the Université de Moncton. The launch will be followed by free e-cinema screenings of the film between December 1 and 3, in five cities across New Brunswick, as part of Les Rendez-vous de l’ONF en Acadie. “Ginette Pellerin’s film offers a heartfelt tribute to Antonine Maillet on the 30th anniversary of her winning the Prix Goncourt. The documentary paints a sensitive and unforgettable portrait of the great writer, one of the best-known and most powerful voices of Acadian culture and the Canadian Francophonie. It makes the life and work of this unique artist even more accessible. As a promoter of Acadian talent for the past 35 years, the NFB’s Acadia Studio is glad to have collaborated with Améri Ka Productions and the Université de Moncton in making this project a success and an enduring record for future generations,” said Monique Simard. The public is invited to attend the launch of the film in Moncton on November 18 in the presence of Antonine Maillet. Tickets can be purchased at capitol.nb.ca or by calling 506-856-4379 or 1-800-567-1922, or in person at the points of sale listed on the Capitol Theatre’s website. There will also be free e-cinema screenings of Antonine Maillet – Les possibles sont infinis in the five New Brunswick cities hosting Les Rendez-vous de l’ONF en Acadie. These screenings will be attended by Antonine Maillet and Claude Joli-Coeur, NFB Assistant Commissioner, in Caraquet (December 1), Bouctouche (December 2) and Moncton (December 3), and by Ginette Pellerin in Caraquet (December 1), Kedgwick (December 2) and Edmundston (December 3). For more details, go to onf-nfb.gc.ca/eng/rendez-vous. 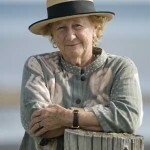 Antonine Maillet first made her name in 1971 with the hugely successful La Sagouine and achieved international recognition on winning the Prix Goncourt for her novel Pélagie-la-Charrette in 1979. For 50 years, she has been a voice for the Acadian people throughout the world. The only Canadian winner of the Prix Goncourt to date, she has published close to 50 works in as many years. Ginette Pellerin’s documentary invites viewers to accompany Maillet to the important places in her life, from Bouctouche to Montreal by way of Moncton and the Théâtre du Rideau Vert. Rarely has the writer spoken of herself with such candour and generosity, revealing a tremendous discipline, energy, self-assurance and lucid appreciation of her life and work. The result is a remarkable autobiography: Antonine Maillet – Les possibles sont infinis, produced by Murielle Rioux-Poirier of the NFB’s Acadia Studio, in co-production with Pauline Bourque of Améri Ka Productions. Ginette Pellerin, co-founder of Productions Phare-Est and Améri Ka Productions, has been working in television and film/video production since 1981. After earning a bachelor’s degree in Visual Arts from the Université de Moncton, she became interested in documentary, directing L’Âme sœur, in 1990. This was followed by many more films produced or co-produced by the NFB, including Se donner des « elles », Évangéline en quête, Mathilda, la passionnaria acadienne and Durelle, as well as several episodes of the documentary series Trésors vivants. Pellerin has received a number of awards and honours, including the 2002 Prix Historia from the Institut d’histoire de l’Amérique française for Anna Malenfant d’Acadie, which was also short-listed for a Gémeaux Award. She spent three years working on Antonine Maillet – Les possibles sont infinis. Canada’s public film producer and distributor, the National Film Board of Canada creates social-issue documentaries, auteur animation, alternative drama and digital content that provide the world with a unique Canadian perspective. In collaboration with its international partners and co-producers, the NFB is expanding the vocabulary of 21st-century cinema and breaking new ground in form and content, through community filmmaking projects, cross-platform media, interactive cinema, stereoscopic animation – and more. Since the NFB’s founding in 1939, it has created over 13,000 productions and won over 5,000 awards, including 12 Oscars and more than 90 Genies. In 2009, the works of NFB animation pioneer Norman McLaren were added to UNESCO’s Memory of the World Registry. The NFB’s new website features over 1,000 productions online, and its iPhone app has become one of the most popular and talked about downloads. Visit NFB.ca today and start watching!